The stamp was issued to mark the World Columbian Stamp Exposition in Chicago in 1992. 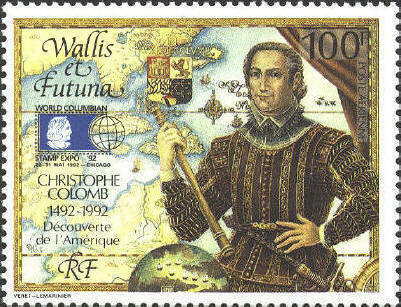 It shows Columbus holding a telescope, beside a globe,in front of a map of the West Indies. However, the telescope was invented by Galileo Galilei in 1610, over 100 years after Columbus. The first globe was made by Martin Behaim in 1492, but it is doubtful that Columbus would have ever seen it. Of course, no map of the West Indies would have been available. The map also shows a portion of the the North American continent which Colombus did not know. The portrait is based on a painting in the Galleria di Palazzo Rosso, in Genoa. An error of another sort also connected with the stamp appears in The Carto-Philatelist for December 1992, where, on pages 135 & 137 the stamp is given the Scott Catalog Number 428. The correct number is C169.